Finally, I went to Dazaifu this weekend. Known for its shrine and National Museum, Dazaifu is a small tinsel town just 30 mins by train from Fukuoka city. It was a slightly grey rainy day; probably not the best day to visit Dazaifu, but Plum-blossom is awesome any given day. Got 1000 yen pass from Tenjin JR station that covers two way journey and traditional Dazaifu style tea set on arrival. It always amazes me how Japanese people celebrate every cultural event with enthusiasm and so religiously, no matter how small the significance of that event may be. It’s the commitment and zeal that matter and not how significant the event is. Fortunately, there was a cultural play going on at the shrine when we arrived and the involvement of Japanese people in the play was really intense as they really seemed connected to it. 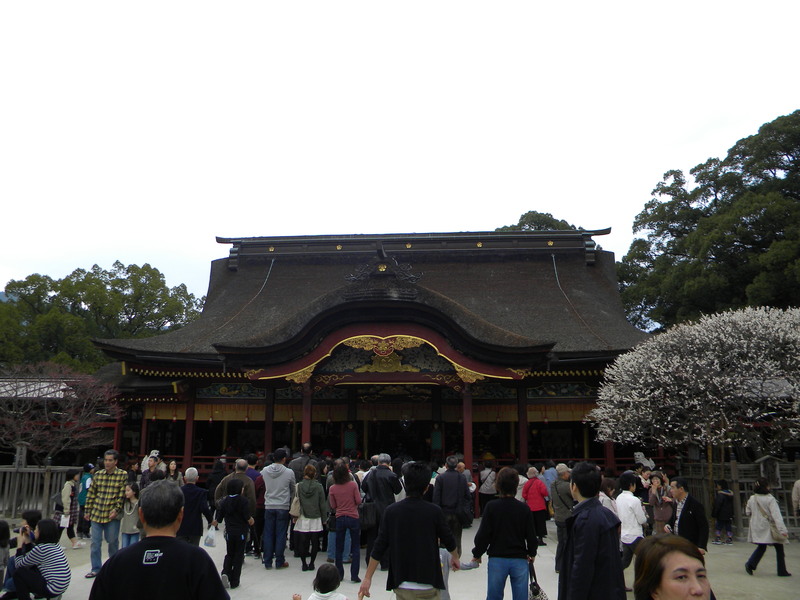 Well, I was more than happy to see the shrine during Plum-blossom; Japanese students are very regular to the shrine, esp. after exams because that’s the place where they go to pay obeisance and pray for good marks in exams. I don’t usually go to the museums but since we had travelled to Dazaifu, I decided to go the National Museum as well. The newly constructed museum is amazingly beautiful to say the least. The biggest attraction and surprise for me was the big collection of antiques, statues and other stuff from India; made me feel proud in front of my friends. Well, my spring vacation is on till end of March. I’ll surely be travelling a lot more in a week’s time and hopefully I’ll be able to write down those memories here. ~ by pankajsingla9 on March 2, 2011. Hi, how are things at your end? Hope life is back to normal. Its fine now.. getting better.. should be completely alright in a few days. Japanese people are really brave.. they’ll pull it off..